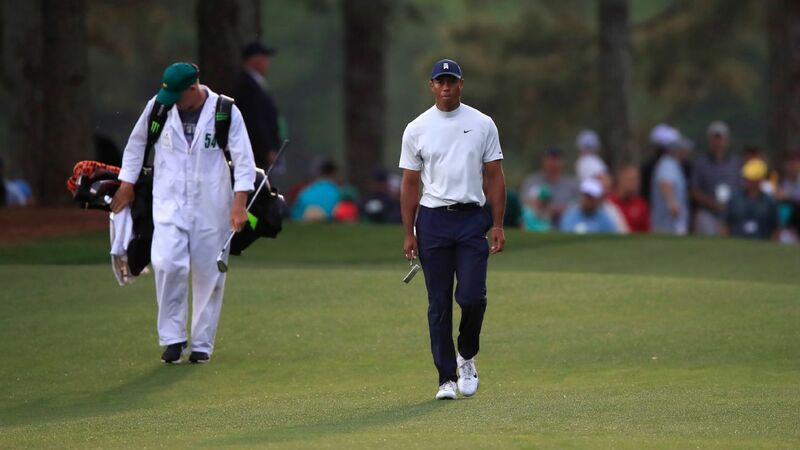 AUGUSTA, Ga. — Tiger Woods had emerged from a door near the Augusta National clubhouse, had turned left toward a tangle of reporters when his close aide, Rob McNamara, called out his name. “Watch out for those security guards,” McNamara said. The aide laughed. Woods laughed. Tiger would try to downplay the surreal scene on the 14th hole of the second round of the Masters, where an overheated Georgia Bureau of Investigations special agent nearly took out the most special golfer on the planet. But Tiger’s dramatic yearlong-and-change comeback could’ve crashed and burned right on the spot. Woods could have lost his shot at a fifth green jacket, and his chance to win his first major championship in more than a decade, because a man trying to protect him violated one of the many cardinal rules of Augusta National — no running allowed. You can stand at Augusta. You can sit at Augusta. You can even walk at Augusta. But everyone who has ever passed through those forbidding gates and entered this monument to the 1950s knows you can never run at Augusta. Trust me, I found out the hard way covering my first Masters many years ago, where my slow jog from clubhouse to media center was interrupted by a security guard who thrust out his open right hand and screamed at me to stop. Tiger Woods’ day included a collision with a security guard, a momentum-killing weather delay and a wild run down the stretch. Here is the full list of tee times for the third round of the Masters at Augusta National Golf Club. Five players are tied for the lead. They’ve all won majors before. That doesn’t even count Tiger and D.J. Buckle up, this could get good. He didn’t add, “For keeps,” but he didn’t have to. For the next 19 Masters I’ve covered, including this one, I’ve never even thought of running like that security officer (of all people) did Friday when he thought he was protecting the GOAT from a rain-soaked herd of encroaching humans. Here’s how it went down: Woods hit the kind of shot that won him 14 majors, a shot from the left trees that only a true artist could picture in his mind, and as his divot flew toward a TV camera the starstruck fans started to close hard on him. Apparently fearing that someone would make contact with Woods, or even poke him with one of the many green-and-white umbrellas in the crowd, the officer blew past Woods’ caddie, Joe LaCava, and raced toward Tiger from the player’s rear. As he realized he was about to run smack into Woods, the special agent hit the brakes in the slick, muddy grass and clipped the golfer as he went sliding by, looking very much the way Ty Cobb did when he was trying to break up a double play and, more to the point, break the second baseman’s leg. Though it appeared the officer hit Tiger’s right ankle, Woods later said he felt the contact around his right knee. Tiger started hopping on his left leg, using his club to balance himself, as he winced in pain. Had his foot been firmly planted when the officer struck him — it appeared to be slightly off the ground on contact — Woods could have been seriously injured. He might’ve been forced to write a sequel to the epic story he authored in 2008, when he won the U.S. Open on a broken leg. Instead Woods regained his footing, rubbed some dirt (or mud) on it, and drained the long birdie putt that landed him at 5-under and inspired a fist pump borrowed from his prime. No golfer has ever played in front of more people or made more things happen than Tiger Woods. So he followed his absurd birdie at the 14th with another absurd birdie on the 15th to move one stroke out of the lead. Woods missed short birdie attempts at Nos. 17 and 18, but those lost opportunities didn’t diminish the moment. Five men, all major winners, shared the 36-hole lead at 7 under (never in golf history had more than three major champs shared the lead after any round of any major), and not one of those men viewed the 43-year-old Woods as a non-threat. It’s a country mile better than good. When Woods was finished with his 68th stroke of the day as part of the penultimate group, fans started abandoning the 18th green and heading for the exits. The final group, featuring Rory McIlroy and Rickie Fowler, finished up before a small gathering of family and friends. Truth is, that special agent knew he got a little lucky on his unlucky day. Woods said he didn’t get hurt, and answered the close encounter with back-to-back birdies. So was everyone who loves a great golfing story. Woods was quickly installed as the betting favorite in Vegas, drawing 6-1 odds, and for good reason. Golf is often described as an exercise in psychological warfare, in confronting your most forbidding demons and doubts. On the course, Woods has always had the mental strength of 10 men. He overcame four back surgeries, including a spinal fusion, and pain that left him bedridden. Friday he overcame a cop who forgot that you’re not allowed to run at Augusta National. What doesn’t kill you, or clip you, makes you stronger. Tiger Woods won his 14th major title on one leg. He’s fully capable of winning his 15th on two.